Drug and alcohol addiction is now collectively one of the leading public health issues in the United States. Last year, drug overdose killed over 72,000 Americans, according to data from the Centers for Disease Control and Prevention (CDC), which also reports that alcohol kills about 88,000 people per year, both through direct and indirect causes. Despite escalating rates of drug- and alcohol-related fatality, many substance use disorder (SUD) sufferers find it incredibly difficult to get quality treatment because of the costs that are often involved with the process. Subsequently, reforms have been made to insurance that have mandated increased coverage for the disease of addiction. 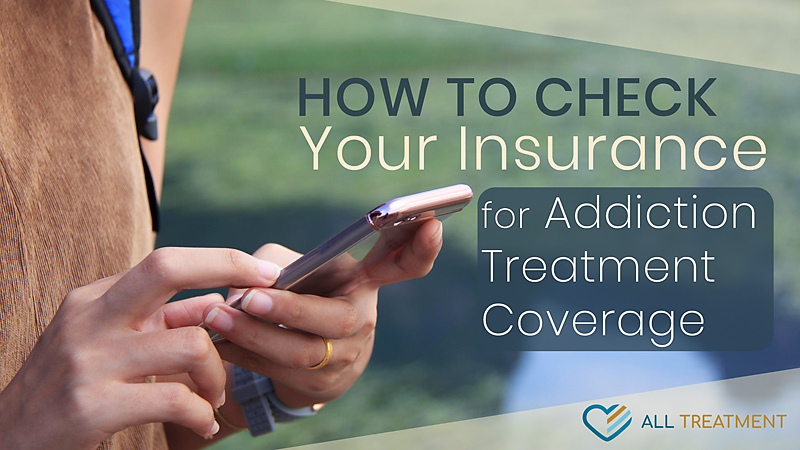 Knowing how to check your insurance for addiction treatment coverage can expedite your entry into care, so you can begin your recovery. If you’re wondering how to pay for a treatment facility, it helps to ask them directly. Most drug and alcohol rehab centers have a full staff of intake and admissions professionals to help prospective patients and their loved ones understand their payment options; this includes providing a comprehensive insurance verification process to help you understand your scope of coverage. Your insurance assessment will be a standard part of the screening process to help you or your loved one make an informed decision regarding where to seek care. Insurance verification takes very little time and is a critical part of the admissions process. There is perhaps no more direct way to find out what your insurance company pays for than by contacting them and getting a comprehensive idea of your coverage options. You can also consult AllTreatment’s database of treatment centers to find out which facilities accept your insurance. They can also help you find supplemental coverage if you find that you are underinsured. What Kind of Care Do You Need For Addiction? Your scope of coverage is largely contingent on the type of care you’re looking for. Many mid-level insurance plans are much more apt to cover outpatient or intensive outpatient (IOP) options before residential or inpatient services. Most insurance plans will cover detoxification to help patients address the immediate medical issues and withdrawal symptoms associated with substance abuse. Limitations to coverage may include level of care, duration of treatment, coverage to certain therapies, and more. Out-of-network treatment providers may require a higher initial investment, and some may not even be covered at all. In-network treatment providers have existing agreements with your insurance company and can provide care at a much lower rate. Your health insurance can be a game-changing element in ensuring you get the care you need to overcome addiction and rebuild your life. Talk to your insurance company or prospective treatment provider to find out what your options are, and get help now.